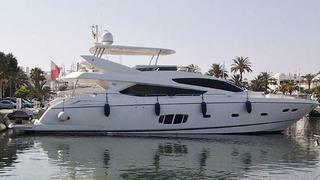 News just in from Oliver Sieckmann at Sunseeker Germany of a €300,000 price drop on the 24.4m motor yacht Noah White. A one-owner yacht, Noah White is a Sunseeker 80 dating from 2010 and accommodates eight guests in an Italian-influenced interior. Twin MTU V12 2000 M93 engines give her a cruising speed of 24 knots. Noah White is now down from €3.49 million to €3.19 million, tax paid.